Wood Destruction by a Woodscrub: Why you should inspect your wood before planing. Apparently there was a small crack in the maple. 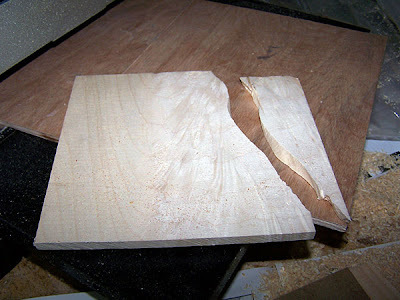 When the stress of going through the planer hit it, the small piece broke off and ejected from the input end of my Craftsman 12 1/2" planer at high (read: dangerous) speed. It flew 16 feet. Luckily for me I don't stand in front of the planer, preferring to stand to the side.